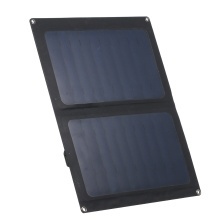 With its lightweight and portable design, this foldable solar panel is your best choice. Without built-in battery, no troubles caused by heat or strong sunshine. Perfect to use in the outdoor environment, like camping, hiking, climbing. Ultra-thin and foldable design makes it easy to carry, can be easily taken to outdoor activity to charge smartphone. High-quality sunpower panels convert up to 20% of solar power to energy. Featured with a hook, make it possible to attach it to your backpack or tent. Power supply by solar energy, which is clean, endless and environment-friendly. Perfect accessories to use in the outdoor environment, such as camping, hiking, climbing, to ensure in-time power supply. IP65 protection grade, it can be used even in bad weathers. 1. Do not scrape the surface of the solar panel with sharp objects. 2. When charging the charger with solar energy, please place the solar panel facing up in direct sunlight to ensure the best charging effect. 3. Please do not use it as emergency charging when it is raining for avoiding short circuits. (The front of the solar panel is water resistance (keep the USB and DC interfaces away from water).